The weather's getting nicer, which means it's time to head to the sunny beaches of Biloxi, MS for another episode of Wrestling With Friends! The Friends enter this episode trying to recover from being pre-empted by the Westminster Kennel Club Dog Show last week. It doesn't take long for them to shake the cobwebs and dive right into the past two weeks of wrestling news. 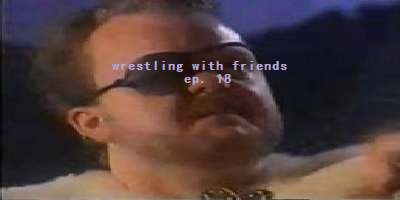 They cover off on the return of Evolution, Showtime Eric Young's improbable TNA World Title win and the soap opera that is Extreme Rising, all the while getting reacquainted with the kind of friendship and camaraderie you only get here, on Wrestling With Friends! What better segment to come back with than the Judy Bagwell Awards, featuring three of the most infamous people/matches/moments in professional wrestling history? Only one can come away with the esteemed Judy Bagwell Award, and since the Friends had so much fun last time with a guest judge, they do it again! Friend to the show, Showtime Eric the Lesser, comes on to make the difficult decision between the WWE profiting from Jerry Lawler's heart attack, Big Bossman hanging from a Cell & the WCW Mini Movie leading up to the 1993 Beach Blast. After much deliberation, the inevitable choice is made—once again leading to dissension between the Friends. Good thing The List is always there to close the wounds as the Friends discuss their #83 picks.